← Here’s much to do with hate, but more with love. Posted on March 6, 2018 by equinson	• This entry was posted in Romeo and Juliet. Bookmark the permalink. In tonights reading of Act 1 Scene iv in Romeo and Juliet, Mercutio talks to Romeo about love. Romeo tells Mercutio in this scene, “So stakes me to the ground I cannot move.” In other words, Romeo is saying, it’s so heavy that it pushes him to the ground and he can’t move. Mercutio replays with, “you are a lover. Borrow Cupid’s wings / And soar with them above a common bound.” When he said this he was telling Romeo that he is a person with a lot of love inside and so he should take Cupid’s wings and fly higher than the average men. Next Romeo states, “I am too sore enpiercèd with his shaft / To soar with his light feathers, and so bound, / I cannot bound a pitch above dull woe. / Under love’s heavy burden do I sink.” This can be translated to, the bow has went to deep and he can’t fly cheerfully. Also, he can’t fly higher then his sadness takes him. Mercutio replays by saying, “And to sink in it, should you burthen love— / Too great oppression for a tender thing.” From my understanding, this means that if he is stuck, he will just be dragging love which is a beautiful thing. Romeo says, “Is love a tender thing? It is too rough, / Too rude, too boisterous, and it pricks like thorn.” This is saying how Romeo is asking, is love really that great, it’s so harsh, rude, and hurts you. Finally Mercutio replays with, “If love be rough with you, be rough with love. / Prick love for pricking, and you beat love down.” In other words, if love is rough on you, then do the same to love, get even with love and then you’ll beat love. 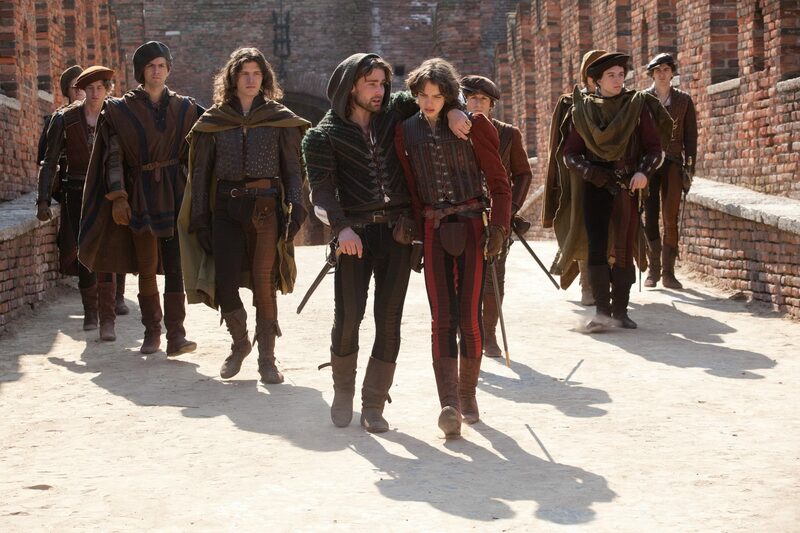 Throughout this, Romeo is being given advice from Mercutio and is learning a lot. Mercutio tells him that he can’t let one thing stop him, he has to keep fighting and not give up. By doing this, we see a lot of Mercutio’s characteristic traits come out. Mercutio is strong and is a good role model for Romeo. When I say strong, I mean that he is not afraid of something that is hurting him, he will work it out. Finally, he won’t take “no” and “can’t” for an answer which can have both a negative and positive impact. To conclude, Mercutio is a very sweet gentleman who is helping Romeo through this tough time. In Act I, Scene iv of Romeo and Juliet, we witness a conversation between Romeo and his friend Mercutio, as they go towards the Capulet’s party. Romeo starts by saying, “So stakes me to the ground that I cannot move.” (ll. 16, page 43). In other words, he is saying that his soul (mentioned in the lines above) is so heavy, which forces him to be stuck to the ground, preventing him from moving. Mercutio then responds, “You are a lover. Borrow Cupid’s wings/ and soar with them above a common bound.” (ll. 17-18, page 43). Here, he is stating that Romeo has fallen in love, and should take Cupid’s wings and use them to fly higher than others. Romeo then states, “I am too sore empiercéd with his shaft/ To soar with his light feathers, and so bound/ I cannot bound a pitch above dull woe./ Under love’s heavy burden do I sink.” (ll. 19-22, page 43). When paraphrased, I found it to mean that Romeo is so in love, (or so pierced with love), so he cannot fly with Cupid’s wings. His love weighs him down, not allowing him to fly any higher than his sadness. He sinks under the heavy burden that love gives him. Mercutio then replies to him, saying, “And to sink in it should you burden love-/ Too great oppression for a tender thing.” (ll. 23-24, page 43). To me, this meant that Mercutio is telling him not to drag down love, for it is too beautiful. Romeo then tells him that, “Is love a tender thing? It is too rough,/ too rude, too boist’rous, and it pricks like thorn.” (ll. 25-26, page 43). Here, Romeo questions Mercutio. Is love really a beautiful thing? he asks, then he gives reasons why he thinks it isn’t. He says it is too rough, too rude, and hurts like being pricked by a thorn. Mercutio responds, “If love be rough with you, be rough with love./ Prick love for pricking, and you beat love down.” (ll. 27-28, page 43). Mercutio is basically saying, if love is rough on you, you should be rough on it. Prick love when it pricks you, and you’ll be able to beat it down. I found this passage very interesting. Mercutio gives Romeo some advice in regards to his love life, telling him that if he can’t use love to his advantage, he must fight back and beat it until he feels nothing. This contrasts that of Benvolio’s advice, which is to ignore love, and distract yourself. If Romeo ignores, he says, he will soon be able to forget and get past his crush that basically controls his love. This reveals much about Mercutio’s character. This passage characterizes Mercutio as clever in his way of dealing with love, allowing him to help Romeo with his love problem. We learn that Mercutio seems to be a positive influence on Romeo. While reading, I looked over this passage, however looking much more in depth showed allowed me to get much more out of the text. Great job! You did an amazing job at paraphrasing the lines. Keep up the great work! Great job Matt, your response really showed that you understood what the reading was about. Nice job! Great Job, Matt! You did a fantastic job of paraphrasing and providing analysis of the text. Keep up the great work! Here, Mercutio is trying to help Romeo with his love life because he has given up after the girl that he loves doesn’t want to be with him. Romeo doesn’t want to believe in love any longer. He has found it too hard and not worth it anymore. To him, love is no longer tender but harsh and something you shouldn’t be involved with. Mercutio is trying to help Romeo see that love is actually gentle, lovely and worth it. He wants to help him love again because he believes that love is something that all people should have. He sees that Romeo has the potential to love and to be loved and doesn’t want him to miss out on that opportunity. This shows us that Mercutio has a heart and is really a good person if he wants to be. The fact that he was very willing to show Romeo what could be good in his life if he let himself do it. Great blog! I liked your interpretation of it. Today we read scenes 3-4 of Romeo and Juliet. In scene 4, Romeo and Mercutio talk about Romeo’s love issue. Romeo says, “So stakes me to the ground I cannot move.” He means by this that the weight of his sadness and makes him so miserable that he can’t do anything. Mercutio replies with “You are a lover. Borrow Cupid’s wings/ And soar with them above a common bound.” Mercutio is saying that Romeo is in love, and that he should take the wings of the person who made him in love and use them to fly about all others. Romeo then says, “I am too sore enpiercèd with his shaft/ To soar with his light feathers, and so bound/ I cannot bound a pitch above dull woe./ Under love’s healthy burden do I sink.” Romeo means that the arrow that pierced him with love still hurts, his burden is too heavy for him to fly lightly with Cupid’s feather and he cannot go any further than feeling sad and horrible. Mercutio says back, “And to sink in it should you burden love-/ Too great oppression for a tender thing.” Mercutio thinks that love is no burden, and that Romeo hates it too much. Romeo says, “Is love a tender thing? It is too rough,/ Too rude, too boist’rous, and it pricks like a thorn.” Romeo thinks the opposite of Mercutio. Romeo believes that love is not tender; it is harsh, rude, loud, and harms you like a thorn does. Mercutio replies to Romeo by saying, “If love be rough with you, be rough with love./ Prick love for pricking, and you beat love down.-” Mercutio says that if love is mean to you, be mean back. Get revenge on love. It hurt you so your hurt it back, and that is how you get out of your misery. The gist of Mercutio’s advice is that the way to overcome love is by being rough and harsh with it. What he and Benvolio have in common is that they both want Romeo to be happy, but Mercutio’s advice is more violent and tells us that he is more of a fight-now-talk-later type of person. He also seems to be a kind man who, like Benvolio, wants the best for his friend. This original is on top and my translation is on the bottom indented. In this scene we see Mercutio giving Romeo advice about love. What he tells him is that he shouldn’t take it so seriously. He tells him to fly with cupid’s wings and not drag love down. He also tells him that if love is being rough with him to be rough with love. I’m not sure what this means exactly but I guess I will find out. Earlier in the play, Benvolio gives Romeo advice too. Benvolio says that Romeo should find another girl to love at the feast they go to. This advice is similar to Mercutio because they both tell him to stop weeping. What Mercutio says tells us he’s light-spirited. It tells us he doesn’t like to be sad. Both of these pieces of advice are good but I think Romeo will not listen. It didn’t indent but my translation is under each original line. Great job Abby. I like how you provided both the text and your paraphrasing in an easy to read format. Lines 16-28 of Act I Scene iv Romeo and Juliet consists of a conversation between Romeo and Mercutio. It says “(Romeo) So stakes me to the ground I cannot move/ (Mercutio) You are a lover. Borrow Cupid’s wings/ and soar with them above common bound./ (Romeo) I am too sore enpierced with his shaft/ To soar with his light feathers, and so bound/ I cannot bound pitch above dull woe./ Under love’s heavy burden do I sink./ (Mercutio) And to sink in it should you burden love-/ Too great oppression for a tender thing./ (Romeo) Is love a tender thing? It is too rough,/ Too rude, too boist’rous, and it pricks like a thorn/ (Mercutio) If love be rough with you, be rough with love,” (Pg. 43, Lines 16-28). To paraphrase, (Romeo) My soul is heavy, keeping me from moving, (Mercutio) You have fallen in love; embrace it, (Romeo) I am so in love, that I cannot embrace it so easily, I am sinking under this burden, (Mercutio) To just sink under it is impossible, love is a light feeling, (Romeo) Is it light? It is too harsh and painful to be light, (Mercutio) If love is heavy on you, be heavy on love. Pretty much Mercutio is giving Romeo love advice. Romeo wants to give up on the girl he loves because it is just too painful to bear. He wants to give up on love all together. It has hurt him and is slowly killing him on the inside. This relates to what Ms. Quinson said about how she felt when she first fell in love. She said that it didn’t feel right- love was supposed to be this happily-ever-after causing force, but she didn’t feel like she should be in love. All the adults around us act like love is amazing, but it might not feel like it to someone. I think this is what is happening to Romeo. He is overwhelmed with the feelings he is suddenly hit with, and he doesn’t know what to do. In his case Mercutio is like all the adults. He thinks that he shouldn’t just give up if the feeling is so powerful. I think that Mercutio’s point makes sense. Romeo shouldn’t just give up on love- especially since so many other people have made it through. Nice job, Hailey! I like how you said Romeo shouldn’t give up on love – he should follow Mercutio’s advise and keep trying. In this conversation, Mercutio attempts to advise Romeo about his love life. Overall, he tells him to continue with his love, and not drag it down with his misery. He should fight love back, and he will beat it down. Contrasting to Mercutio’s advice, Benvolio had suggested Romeo look away from Rosaline, and see other girls. Then, he said, he would realize how much better other beauties were than his. Earlier in the play, I noticed Benvolio always endeavored to keep peace. Perhaps his advice is a product of his disposition, trying to avoid direct fights and conflict. If this is true, I can infer that Mercutio would be the opposite. I’d predict he would be the quick to fight character that always looks for a battle. He even advises Romeo to fight back against love. This allows us some insight into Mercutio’s character. In this conversation, Mercutio tries to give Romeo advice on love. He says that he should not give up loving the love of his life. If he cannot do so, then he would have to beat down love until he stopped feeling it. The word mercurial means “unpredictable”. Mercutio and mercurial are correlated. Mercutio stated something that not many people would say. How many times have you heard someone tell you to beat up love? Benvolio’s name has a correlation with the word good, so he tries to help Romeo and try to have empathy for him by telling him to pursue his love no matter what. Both people are trying to help Romeo, however, they have different forms of advice. Nice blog. What you lacked in length, you made up in your analysis of the text. I liked how you tried to research what the name “Mercutio” meant and tried to use that new knowledge to decipher why Mercutio gave the advice he gave. In Act 1 scene iv of the play Romeo and Juliet by William Shakespeare, we see a battle of metaphors between Romeo and Mercutio. The battle of metaphors begins after Romeo says the weight of his soul is making it impossible for him to dance at the Capulet’s party. The first line in this dialect, spoken by Romeo is, “So stakes me to the ground I cannot move.” In this sentence, Romeo refers to his heavy soul which preventing him from moving. Mercutio’s retort is, “You are a lover. Borrow Cupid’s wings And soar with them above a common bound.” Mercutio is asking Romeo to take love’s wings and use them to fly higher than the average limits. Romeo sadly replies, “I am too sore enpiercèd with his shaft to soar with his light feathers, and so bound, I cannot bound a pitch above dull woe. Under love’s heavy burden do I sink.” A summary of what Romeo is saying is that Cupid’s arrow has injured Romeo too much for Romeo to be able to fly higher than his sorrow and distress. Instead of flying the weight of love load makes me fall. Mercutio still tries to convince Romeo that Romeo can move and dance by saying, “And to sink in it should you burden love—Too great oppression for a tender thing.” In this instance Mercutio is saying when you drown, you are also bringing-down love. Which is to much pressure on a gentle force like love.” Romeo makes a nice comeback to Mercutio’s statement by asking, “Is love a tender thing? It is too rough, Too rude, too boist’rous, and it pricks like thorn.” In this case, Romeo statements are equivalent to, “Is love gentle? No, love is overly irregular, uncivil, and rambunctious. Love hurts like a thorn .” Mercutio’s final statement on love is, “If love be rough with you, be rough with love. Prick love for pricking, and you beat love down.” What Mercutio means in this final statement is that when love hurts you, hurt love in return. Eventually, by doing, this you will stop love. Mercutio and Romeo have extremely contrasting views in love. While Mercutio sees love as good and with many advantages, Romeo sees love as a weakening burden. Overall, I like Mercutio’s positive view of the situation, but I disagree with his final lines. Trying to attack love is hopeless, Romeo will always be in love so the best thing he can do is to try and be optimistic. I really like the metaphor and comparison you came up with, with the weight on Romeo’s shoulders, and he cannot soar because of that. I also interpreted Mercutio’s point of view as telling Romeo to distinguish these feelings, or perhaps he was telling Romeo to get even with the one he loves. Great work. To paraphrase lins 16-28, Mercutio is basically saying to Romeo, you are a loving man; Pretend you are Cupid, and use his wings to take a leap of faith above the limits. (Romeo then says,) I am in too much pain by the shaft of cupid’s bow to take the leap with his wings, love has placed a burden on me, and it weighs me down. (Mercutio) But to remain on the ground, you would still be burdened. This is too much stress for such a nice thing. (Romeo) Is love nice? Love is annoying, and it hurts. (Mercutio) If love never treats you right, then don’t cater to the idea of love. If love causes you so many problems, then suppress those feelings. Mercurio is nothing like Benvolio. Benvolio’s advice for Romeo was to help him ease through these feelings, and to be careful. If his love with Juliet has been upsetting him, then maybe he should find the bad traits in their romance so he can feel better. Mercurio wants Romeo to go after Juliet. Instead of trying to make Romeo realize that love isn’t perfect, he tries to make Romeo believe that it is all or nothing. Either Romeo can still continue to fall for her, or he can reject his feelings all together. I still don’t understand the long speech Mercurio was giving Romeo. I suppose I can gather the gist, but I was still confused about why Shakespeare added certain details to make it so lengthy. My soul is made out of lead, making it very heavy and hard to move. You’re a lover, and should carry out the role of cupid to become superior to the average man. I can’t leap any higher than my melancholy emotions. I just sink under the heavy weight of love. If you sink, you’re dragging love down, which is not the right thing to do. Is love really all that tender? I believe that it is too rough, rude, and unpleasant like a thorn. If love is rough with you, be rough with love. If you fight back against love you can beat love down. Mercutio gives Romeo some advice in accordance to his struggling love life. It is evident that Romeo does not have the best love life, and he is quite depressed after the girl he loved didn’t love him back. He has found love very difficult due to his bad experience. Romeo is being told that if he can’t use love to his advantage, he must fight back and beat it until love is beaten, and he feels nothing. Mercutio believes that the best way to overcome the struggles of love is to beat love itself that is creating all the problems. This scene reveals a lot about Mercutio’s character and relationship with Romeo. Mercutio is a very wise man who seems to be the perfect mentor towards Romeo. He provides Romeo with proper love advice and adequate solutions to his problems. Mercutio has a very positive impact on Romeo as well as a close relationship when discussing personal topics. I hope to read and learn more about Mercutio along with his relationship. I wonder if and how their relationship will change throughout the course of the story. Great response Ajay! You helped me develop my own analyze for this section, and I learned a lot from your blog. Tonight’s blog is to paraphrase lines 16-28 in Act I scene iv, so I’ll just jump right in. [Romeo] My heart is so heavy (15) that I cannot move (16). [Murcutio] You are in love. With that love (17) be better than all the others (18). [Romeo] I have been struck to hard with Cupid’s arrow (19) to (metaphorically, of course) “fly” with Cupid’s wings, and so I cannot leap in such a way, (20) I can’t even leap at all (21) because of love’s burden (22). [Mercutio] You are the one who burdens love, (23) for love is too beautiful to do such terrible things to a person (24). [Romeo] Is love really so great? It is too rough, (25) too inconsiderate of another person’s feelings and all too painful (26). [Mercutio] If love is bad to you, then be bad to it (27). Wound love for wounding you and you defeat it (28). My soul is heavy, and pulls me to the ground. Because love’s load pulls me down. too rude, too rowdy, too painful. If your love is rough, then be rough with your love. If your love is hurting you, you attack it. Mercutio is giving a love lesson to Romeo, and in a way, it is similar to Benvolio’s. They are both encouraging him to see the good side of love, and to face its challenges. Mercutio is saying that if love treats you badly, then treat love badly. He is telling Romeo to not be afraid of love, even if he feels depressed from it, and feels unsure about love. He is telling Romeo to fight, and not give up on the one he loves. Mercuito is encouraging Romeo to embrace the love, and face it. Dragging his love will only do him worse. Great response Ellie! I love your paraphrasing, it is great. Nice work. Paraphrase: My soul holds me to the ground. You are a lover, so use Cupid’s wings to go higher than others have before. I am too deep in love to be able to use those wings. I will not go very high, as love’s weight brings me down. If you don’t try to fly you deserve that weight, love is too light to be hated. Is love really a good thing? It is heavy, too mean, too brash, and cuts me like a thorn. If love is mean to you, be mean to love. Cut love for it’s cutting of you, and you’ll hate it. Mercutio and Romeo talk about Romeo’s love life in scene four of act one. Mercutio sees that Romeo has little to no confidence in his ability to catch the eye of the person who he is in love with. So, he tells Romeo that if he is to ever be happily in love, he will have to man up and go for her. He won’t get her if he just sits still and watches her from afar. He has to be bold and make his own move, instead of waiting around for her to make a move on him. Mercutio is also saying that Romeo will continue to hate love if he keeps thinking that it is a horrible thing. Romeo has been faced with incredible pain and suffering due to love, but Mercutio is telling him that he can turn love into something that gives him joy and happiness. The advice that is being given to Romeo seems to be that of someone who’s determined and willing to fight for himself. As such these traits seem to generally describe Mercutio. We see that Mercutio while talking to Romeo indirectly describes love as something nimble and precise. When Romeo says that love has caused him pain, Mercutio responds by telling him to fight back. Not only does this show Mercutio’s strong and aggressive personality, but it also implies that love requires some fighting and struggle. This is one of the motifs that I have found in the play write thus far, love and hate. Shakespeare clearly demonstrates how the two are connected both here and in the prologue when he speaks of the hate between rival households that is only broken by two lovers. I have a heavy heart, and it weighs me down so that I can not move. You are a lover. Borrow Cupid’s wings and use them to rise above normal limitations. I have been struck with Cupid’s arrow, and it prevents me from flying with Cupid’s lights feathers. I can not rise above love’s dull misery, and I am crushed under love’s heavy burden. And to feel held down by love would make it a burden. Too unjust for such a gentle thing. Is love a gentle thing? It is too rough, too bothering, and it pricks like a thorn. If love is tough on you, be tough on love. Prick love for pricking, and beat love down. This back and forth between Romeo and Mercutio has plenty to analyze. Romeo is feels love is a burden because he is always trapped in one-sided love. His love is never returned to him, and he is constantly weighed down because he knows his love is not going to be returned. Love is rough on him because he feels unwanted and rejected with every woman he has ever loved. This heavy heartache holds him down and prevents him from being as good a man as any other. Romeo has most likely never had his love returned, and that would explain why he is constantly pained from it. Love is rough not on his body, but his heart. It distracts him, stabs his heart, and beats down his body. Mercutio, on the other hand, believes love is gentle and is full of compassion and empathy. Love is kind to Mercutio, and he can not relate to Romeo. However, we know that love eventually finds Romeo, and he falls in love with Juliet. I want to know how if after all this time of Romeo searching for love, he ends his life after finding it. Perhaps it was love’s torturing way of giving him star-crossed love. We should add that Romeo is looking for returned love to our “Things to keep in mind” section. In act 2 scene iv, we witness an interesting conversation with Mercutio and Romeo. Lines 16-28 were very interesting and this is it paraphrased: “MERCUTIO: It is for sure you are a lover. Take love by the wings and fly higher than any other common man in love. ROMEO: Love has stabbed me and hurt me too deep, I can’t fly with its pure wings. This pain keeps me down and I will stay in sadness. I will sink under love’s burden. MERCUTIO: If you fall and sink, Cupid will come with you. It is horrible to burden something as wonderful as Cupid. ROMEO: Is Cupid really all that wonderful? In my opinion he is too bad, too mean, too rowdy, and he picks you like a thorn. MERCUTIO: If love is rough on you, be rough with love. Pricking love when it pricks you will beat it down.” I think Mercutio is trying to tell Romeo it is not so bad, because right now, he is going through terrible love sickness because Rosaline does not like him. Romeo is turning such a beautiful thing into something that hurts him, and Mercutio wants to let him know that that is not the case.When you bring such a wonderful thing into your misery, that wonderful thing disappears, and this is what Romeo is doing. Mercutio is probably hoping he will meet someone at the party that can brighten his spirits. I also think both Benvolio and Mercutio just want the best for their friend. I really like Mercutio and all of his opinions. He basically said listen, love is beautiful, all of this feeling bad for your self is turning it into an enemy. I am excited to see what happens to these characters and Romeo’s feelings. Here Romeo is still being a sulking little brat. He is finding that things in the world are tough, and everything isn’t always perfect. And he is complaining to Mercutio about it. Mercutio is trying to explain to Romeo that it’s bot that bad, that he can make it through he just has to be tough. But Romeo is too depressed to listen and think about what Mercutio is telling him. Remy, I like your very sophisticated and professional-sounding use of words, especially when you describe Romeo as a “sulking little brat.” I too agree that he needs to get it together and move on. You also have a very good paraphrased version of their conversation, as it is easy to follow and understandable. Great response! The lines 16-28 paraphrased are as following. “Mercutio: You are a lover. Take the wings of Cupid, and with them soar above expectations. Romeo: I am wounded from the piercing of his bow, I am unable to soar with the weight of this love, I cannot rise above my dull and woeful sadness, I drown under the burdens of love. Mercutio: You are held down by love, the pain of such a pure thing. Romeo: Is love pure? Love is too rough, too harsh, too aggressive, and stabs me like a thorn in the hand. Romeo is in deep pain because of his unrequited love, he laments on how miserable love makes him feel. He sees love as hopeless. But Mercutio is attempting to lift Romeo’s spirits and telling him that loving someone isn’t as hopeless as it seems. Mercutio wants the best for Romeo, he wants him to stop his pity party. Romeo is in a very somber place in life, and Mercutio to reassure him is advising him to fight against the demons that plague him. Love is Romeo’s demon and he needs to fight against it. Great response! I have not thought of it that way. Great response! I have not thought of it that way. I especially like your closing sentence. Great job! ROMEO: My heavy heart pins me to the ground and makes me unable to move. And fly above the leap of a common man. I cannot leap any higher than sadness. Love’s heavy weight makes me sink down. It is too much holding back for such a soft thing. Too cruel, too loud, and it pricks like a thorn. MERCUTIO: If love is rough with you, be rough right back at it. Prick love for pricking you, so you can beat it down. The overall gist of Mercutio’s advice to Romeo is that he should not let love hold him down, and if he can’t see it as a nice thing, then beat it back so he can’t feel it anymore. His advice is much better than Benvolio’s in my opinion, because Benvolio was just telling Romeo to forget about Rosaline and find some other hot girl at the party. Their advice is similar as they are both telling him to move on from Rosaline, but Mercutio’s is saying that he shouldn’t let his feelings take advantage of him. This tells us about Mercutio that he is also some sort of romantic, as he seems to have experienced dealing with heartbreak. He seems like a good person to go to when you have a problem, as he will help you go over the options but let you make the overall decision for yourself. I think that he sees love as a beautiful and tender thing, but he also sees that Romeo doesn’t feel the same, so he acknowledges it and gives him other advice. In Romeo and Juliet, Act I, Scene iv, Mercutio is trying to persuade Romeo to have a dance. He says that his soul of lead prevents him from dancing. Mercurio responds saying that he was a lover, and should borrow Cupid wings and soar above the limit. Romeo shoots back that he was too hurt by Cupid’s arrow to soar with light feathers. He also says that he cannot leap anywhere above dull, great sadness, and that he sinks through love’s burden. Mercurio says he should burden love, as it is contains too great abuse for something so tender. Romeo then questions if love is really tender. He thinks that it is rough, too rude and rowdy, and it could hurt you if you touch it. Mercutio responds saying that he should be rough back at love and that he should return the pain. in summary, what Mercurio is saying is that he should return back what love hit him with, and take its wings and soar above expectations. It is similar to Benvolio’s advice because he is also saying to rise above his oppression and forget about her, to distract himself with other lovers. Mercurio’s advice makes me see that he believes in an eye-for-an-eye world. I am interested in the outcome of the Capulet party. You are a lover. Take Cupid’s power and flly with them above expectations. I am too hurt and stabbed with his arrow shaft to soar with the light feathers he has, and I am so bound I cannot make a pitch above my dull sorrow. I sink under Love’s heavy weight. And to fall in it should you weigh in love, too much pain for such a delicate thing. Is love so pure? It is too hurtful, too uncouth, too feisty, and it stabs like a thorn. If love is hurtful to you, be hurtful with love. Stab love for stabbing, and you beat love. Give me an example to give my meaning in. A visor for a visor. What do I care fir eye deformities? Here are the dark brows shall blush for me. When I see Romeo’s love, i see a different type of love which is most commonly put in perspective today. It is a painful live, a forbidden love. A live that not only hurts the lover, it never leaves the lover. This love is what burdens Romeo day and night, in his dreams, with his companions. It has been so interesting following what he has thought about his love. He hates it, yet he cannot live without it. In these lines of Romeo and Juliet the conversation starts off with Romeo saying that the love that he is holding doesn’t bring him joy but brings him sadness and misery by comparing it to lead that restricts his movement. Mercutio follows up by basically saying that Romeo being a lover is a good thing and he should use this love to help him overcome his sadness, by using Cupid’s wings to fly out of his restrictions Romeo then says that he is “too pained” to get up and that love is an arrow that burdens him heavily. He cannot manage himself above the misery his love brings. Mercutio then says that love shouldn’t do this to a person becuase it is supposed to be compassionate. Romeo counters that by calling love a brutal and harmful state of being. Mercutio then explains to Romeo that he has to do the same that love is doing to him. Be brutal back to love. These lines really showed us romeos true emotions at the time.